Xactly 2013 Comp Cloud Conference — John Murray Productions, Inc. 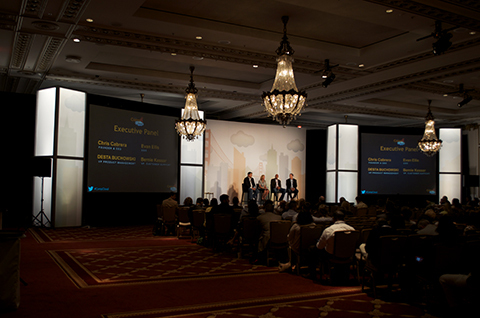 The Xactly Comp Cloud Conference was held at the Palace Hotel in San Francisco this Spring, and for the second year running John Murray Productions, Inc. worked with Seamless Productions to provide the scenic for this event. 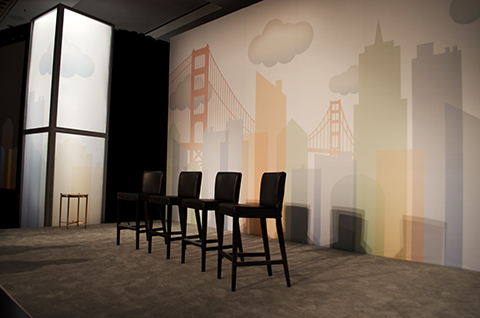 The look, based on the company's logo and web art, featured a 24' x 14' center graphic with a graphic SF skyline. For the two side screens we created surrounds using our GLO wall panels, which held backlit graphics which also incorporated the skyline art. The grand look was professional yet playful, creating an entertaining environment for the conference's attendees.